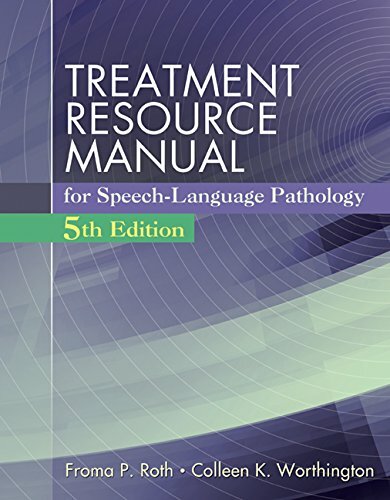 1285851153 -TREATMENT RESOURCE MANUAL FOR SPEECH-LANGUAGE PATHOLOGY, Fifth Edition, is an ideal text for students entering a clinical practicum or preparing for certification and licensure, as well as practicing professionals who need a thorough guide to reliable intervention materials. This detailed, evidence-based text includes complete coverage of common disorder characteristics, treatment approaches, information reporting techniques, and patient profiles across a wide range of child and adult client populations. In addition, the text contains a wealth of practical resources, including information on intervention strategies, goals, and techniques, as well as forms available in digital format for easy duplication and customization to specific experiences. The Fifth Edition features extensive new and updated material to reflect recent developments in the field and current evidence-based best practices. Two new chapters are dedicated to communication deficits in patients with autism or traumatic brain injury, both rapidly growing client populations. Additional updates include discussion of the impact of Common Core Standards on school-based interventions and the reaction-to-intervention (RTI) instructional model, new documentation trends such as self-reporting, expanded coverage of “telepractice,” and new information on group therapy strategies. Widely respected this is a must-have resource for Speech-Language Pathology students and professionals.